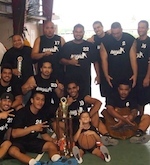 The Pago Youth, in gold and black, were named the 2006 Fagaloa District Basketball League Champions on Monday night following their blowout victory against the Faga'alu Fetu, the only team that ruined the Eagles' almost clean record in the league. Pago almost finished the league without a loss, but a solitary defeat by Faga'alu last week spoiled their record. Just one loss, however, was not enough to steal the top spot from the Eagles and in the final game, Pago demolished the Fetu 75-37. The Fetu finished in second place, the Pago Kings in third, Fagatogo in fourth, Fagasa in fifth and Utulei in sixth. Early on in the league, after several forfeits, Fagaitua bowed out of the league. All teams received trophies and cash prizes. At half-time six females were invited to bank the basketball from the red line to win $10. None of the females were able to make it in. Kelvin helped to seal Pago's victory with 20 points in the game, and in the end he was named the MVP of the Fagaloa League. Fagasa took home the Best Sportsmanship award, and two awards were given to Utulei and the Pago Kings for Best Uniform. Referees for the final game were Pago residents Gordon Coffin and Wally Taufa'asau and Fagatogo Blue Boys' Sam Savali. Officials were also rewarded with tokens of appreciation from the league. Many, many missed shots, too many fouls and their inability to keep up with the very fast paced Pago Eagles running game left Faga'alu at number two. Nevertheless, Faga'alu accepted their second place trophy with a smile and drove off like champions. Starters on Pago were Aries, Kelvin, Avele, Shawn and Reno. On the Fagaalu side were Leroy, Swei, Penitito, Tuliese and Paulo. At the end of the first quarter, Pago was just three points over Faga'alu, 15-12. At the beginning of the second quarter, Pago's Jedediah, #12 was called on a foul against Lutu. Lutu missed on the first bonus shot, but made good on the second, putting them 13-17. Soon afterwards, Kelvin, who would later be named MVP sank it in on lay-up, putting the game at 17-13. The towers of the Pago team, brothers Kelvin and Aries were absolutely unstoppable. Faga'alu had to give up two points on a technical foul for having six men on the court. Pago was able to keep Fagaalu at bay with only 21 points nearing half-time while the Eagles soared to 47 points when the half time horn sounded. Up until the first half the game, the Fetu were running closely behind Pago, however, their shine became less than lackluster following half-time. Pago racked up 16 points in the third quarter but was called on a technical foul for having non-players sitting at the players' bench. Faga'alu proved they were still in the game with lay-up from Tuliese and at the end of the third the score was 63-23 Pago Eagles. One of the youngest of the Eagles, Reno, #4, made good with an exciting reverse lay-up that was followed by a time-out from Pago Pago. Pago returned from the time-out to pummel the Fetu with two more points from Kelvin and then a three-pointer from Faga'alu's Tony, #1, which put Pago at 69-37. With only three minutes left in the game, it was evident that Faga'alu couldn't make up the 38 point lead by Pago.